Costa Rica Fishing Vacation Getaway. Now is your chance. Drop everything and run down to one of the finest countries in Central America, Costa Rica. You want it and you know it! We would like to show you some of the fine opportunities when it comes to a great fishing vacation. The weather here is always warm 365 days a year. In season or out of season there is always plenty of entertainment for everyone. Off Season prices on a Costa Rica Fishing Vacation can save you up to half off. Did you know that it is not necessary that you have to come here during the main season to go fishing? How about that many companies offer tremendous savings on fishing vacations during the off season. Hotels usually will almost give you a room just to get your business. Many of these places offer a all in one package for just two or three hundred dollars per day. If you contact us and let us know when you're planning to travel we can put together a itinerary that will insure your happiness during your stay. Remember, there are deals you can get on fishing trips that are far below the normal prices if you look hard enough or give us a chance to help. What does Costa Rica fishing vacation have to offer? Your vacation will begin from the moment you land in San Jose at the airport, Right away you notice cultural changes and that will continue throughout your stay. Many of these changes will be very interesting when compared to your normal everyday life including the slower pace you will find once you leave the city. Bicycles makeup a portion of the transportation used for the locals and sometimes even tourists enjoy renting a bike to see the small towns located along the Caribbean and Pacific Coasts. You will immediately notice in the smaller towns that the family structure is closer than maybe what you are accustomed to. Grandparents live with there family including sons, daughters, and their children. You will see Mothers walking hand in hand or arm in arm every single day. Most of the people in the country live on a very small budget and with so little they still manage a family structure with tight bonds. You came looking for a Costa Rica Fishing Vacation, so let's tell you about what might be in store for you based upon your final destination and the sport fishing company you choose. Probably one of the most commonly known resort areas along the Pacific Coast is Los Suenos. Offering 5 star hotels and fine dinning as well. There a beautiful golf course in which you can see the ocean from adding to the rich green tropical environment as perfect back drop for a photographers dream. Located right in the small man made bay is a world class marina. Boats ranging from a few hundred dollars a day all the way up to the big yachts in the range of $10,000 a day are at your disposal. You will be able to find a Costa Rica fishing vacation package ranging from a half day at around $350 up to eight days and nights all inclusive from $2,000 to $10,000. Why the large spread on prices? It's all about choice actually. Are you interested in a small comfortable country style hotel or cabins, or do you want the absolute finest lodging available in the area? Makes a big difference! The other part of the picture is your fishing trip. That is what you came here for in the first place. Check out Costa Rica�s world-class sport fishing captains, these are the guys who know how to catch trophy fish. If it�s fly fishing for billfish, going for tuna, or those great roosterfish, I�ll tailor your fishing vacation to where the bite is on. There are two main classes to fishing on the ocean. What is called inshore and the other called deep sea fishing. Inshore fishing doesn't mean on the beach with a big surf pole or using some kind of fly rod fighting the waves and the surf. Inshore fishing means that the boat is usually going to remain within site of the shore at all times during the trip. Water depths are going to range from very shallow up into the hundreds of feet. 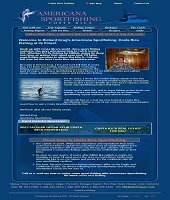 Here the sport fishing based upon the time of year is going to target Roosterfish, Dorado, Snook, Bonefish, Snapper, Wahoo, and maybe a Red Snapper . There are many other types of fish you will find also. The tackle you use will possibly be a little lighter than when deep sea fishing. Trolling is very common but casting and fly fishing can be used depending on the time of day, weather conditions, and the fishing season itself. Your guides will fill you on what is best for that time of the year for your Costa Rica fishing vacation. Usually inshore fishing is for half day fishing trips. This way there is not so much time spent going to and from the fishing grounds allowing an angler to test his skills more than just sitting and waiting to wet a line. Though you would think trying your luck at fly fishing would be for inshore but that is not always the case. Fly fishing on the open water 10 miles out can land you some game fish over 100lbs. Want the ultimate in a Costa Rica Fishing Vacation ? Then you should checkout the fishing packages that have more than one day. These charters allow for you to try all types of saltwater fishing while you're on vacation. Costa Rica deep sea fishing is what true anglers really love about sportfishing in Costa Rica. Most all fisherman will tell you that hooking into a nice Marlin or Sailfish will be something that will put your rod and real to the test and just make your heart pound like it has a new ticker. Trolling with lures and live bait is very common and many times you might land over ten big game fish per day. It is not uncommon at the end of the day that you are exhausted and extremely satisfied with your catch. A Costa Rica fishing vacation is supposed to be the vacation of a lifetime and it is down to the last drop of saltwater that hits your face. The online All-Sport handicapping service. 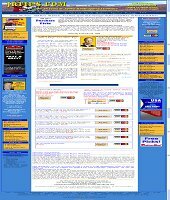 Free NFL, NBA, MLB and NCAA College Picks. The best handicapping advice. Rated one of the top handicappers in the country. What do you need to be prepared for the day? Just what you need for a warm day at the lake anywhere. Sunglasses (preferably polarized), good quality sunscreen, a hat for sure, comfortable shorts or pants, second change of clothes if your on one of the really nice yachts, digital or disposable camera, video camera if you got one. If you have any real strong preferences on munchies bring them too. The charter company usually will provide you with at least one meal and drinks. Sometimes they have snacks available including tropical fruits and sometimes even beer or soda. So is there more you can add to improve you're Costa Rica fishing vacation? Of course there is! You can throw in a restaurant that will cook your fish for you at the end of the day, and let me tell you, Dorado is delicious cooked when fresh. Follow that with a nice evening of some live music at a local night club and maybe a glass of wine while sitting on your deck watching the stars while looking out across the Pacific dreaming about how big a fish you will catch tomorrow. We will be adding Florida Fishing companies on a regular basis including other service providing companies such as lodging and transportation.